Departing every night at about 23:00 hours, these tours do not require much technology. Although I do have a few telecommunication gadgets, such as a satellite radio connection, plus hardware at my fingertips to tune in more than 100 stations, with a micro control to optimize reception, even from faraway AM stations, strictly speaking none of this is absolutely necessary. Also, there is not much need for experience or knowledge. In an attempt for self improvement I have recently studied some Basic Quantum Physics, yet , this too is nonessential. Although there lengthy training is not required, keeping a log is highly recommended, since each flight may add useful practice, and practice makes perfect. Age may possibly be a cause for shorter travel, but this has no bearing on potential distance or interest of destination. A co-pilot may be of great help for easier take-off and particularly difficult landings. My wife is my co-pilot; although she usually falls asleep before take-off, she is always there to hug me when returning to earth and later on she helps with due maintenance to our spaceship, which is one basic piece of equipment I do recommend selecting for optimum quality. In my case, I have a Cal-king box-spring mattress. Other authentic necessities are total darkness and silence. Good classical music is conducive to deep, stable travel. By deep I mean better penetration into worlds visited. Avoid Tchaivkovsky’s 1812 overture, as well as any pugnacious music, for it may bring forth an aggressive, warlike attitude the next day. Soft jazz will fuel romatic passages. Now, if you belong to my generation, the Beach boys will take you back to youth. I have firmly established driving the Route 66 Corvette in one of such travels. If you remain sincerely interested I am able to give you additional advice: Tila tea produces longer, more pleasurable journeys, while red meat and heavy dinning does for complicated navigation. I have had terrible effects and have even put my life at risk as result of excess dinning. For example, I once ate some shrimp (perhaps they were not so fresh, in spite of the restaurant’s good reputation) and so I was unwillingly transported to an Arabian battlefield. I fended for myself as best I could, even valiantly if you can believe me. However, I lack any martial arts ability, so I had to flee. In the chase, my mount became loose and I finally lost grip of my horse, then falling to the ground, where my gut was swiftly cut by a scimitar -I honestly thought I would die, suffocated by my pillow. I was convalescent for a few days. On a more recent occasion, I found myself on a dashing flight to San Sebastían, then something went wrong and I was forced into an emergency landing, for which I used that long stretch of the road by La Estancia. As the wheels touched the ground, a large piece of polyethylene, the kind used on agricultural greenhouses, came flying and stuck to my windshield! Some unending seconds went by while I waited for the inevitable sound of my crash, as I had lost all view for landing. Fortunately, my co-pilot took control and with remarkable dexterity she brought us down, panting, home to the warmth of our lovebed. To assure a timely takeoff, there is non better than a good reading. The Bible, for example, produces such adequate mental state as to guarantee Godspeed, fairwinds, without ill surprises. (” I will both lay down and sleep in peace; for you alone, my Lord, make me dwell in safety” Psalm 4:8) In case of pre-flight anxiety, a few drops of authentic mineral spirits, in a cotton ball under the pillow, will be quite helpful. Now, if you can negotiate a massage, so much the better. There is nothing more dangerous than a radio or TV alarm clock set up to wake up with the news. I have friends whose doctor has this practice strictly forbidden, since news broadcasted are generally bad news; the healthy mind cannot but suffer witnessing pain. Very stressful. Two memorable travels come to memory for me to share with you. On one, I had a date with my late mother and in another I was invited to lunch at some angels’ carpentry shop. I have many others registered in my travel log book, but these two are the most wonderful. My mother waited for me to pick her up in the city of Cuernavaca (famous for its pleasant weather). I arrived sharply on time in my silver 1982 Chevelle (which I really did have that year). She looked stunningly beautiful at some thirty years old, with her classic light yellow dress, wide belt, pearl necklace and earrings. We spent many hours just cruising down avenues with fountains and tall trees, the windows down and the breeze messing up our hair a little. We stared at each other often and talked about so many things. I was filled with joy to once again receive old advices. I, in spite of being 54, drank them all as if they were new, since they were always so helpful. At the end we parked in front of some building where I had some paperwork to take care of (my return flight, perhaps?) I came out to say good-by. There was time for calmly doing all that was appropriate, even receive her kiss and her blessing. I bid her farewell renewing my childhood promises about honesty and work ethics. About the angels’ carpentry shop: it didn’t even seem like a dream. Never had I such a reality awareness. Some seven angels worked silently. They were all at least 10 feet tall, slim but strong. There was an atmosphere of immeasurable peace and creativity. Many hours went by while I helped, or tried to. Communication among them was at a higher level, without words I could hear. Then, somehow I was informed it was lunch time and I would be invited to join. Immediately I accepted, for I had never been so at ease anywhere. So, one of them cleaned wood shavings from the table while another cast a linen tablecloth. I in turn, set the dishes and spoons. Another angel brought some bread loaves. As we sat down at the table, to bless the food, we all lifted our right hand simultaneously to heaven, while the left hand went once around over the dish, clockwise, eyes closed, faces tilted down in devotion. I did everything they did. Were I to be asked what we ate, I would guess it was vegetable soup, but that was not important.. The truth is I would have stayed there forever; even if it was a simple carpentry shop, it was surrounded by beautiful, fragrant landscapes. Suddenly, I found myself in my spaceship, homeward bound. I suppose they knew I meant to stay forever and it just was not my time. .The only thing I was able to keep from such a wonderful visit is the way the angels blessed their meal. I still practice this style on special occasions, with family. I could go on several chapters on this same subject of space travel, but I would be afraid to abuse my readers. 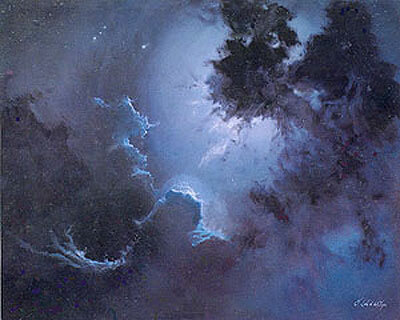 In closing, I present a painting “Night Light”, an oil on canvas, measuring some 5 by 6 feet.